28 years, after the Sallekhana by Acharya Shri Shanti-sagar Maharaj, once again Shri Vrushabh-sagar Maharaj underwent the same holy path of Sallekhana, thus joining to the lineage of those who have contributed to the holiness of this shrine. He was born in the villiage of Mangaon (Rukadi), in Kolhapur district of Maharashtra, in year 1872. His name was Aadgonda Patil, son of Babgonda and Savitribai Patil. 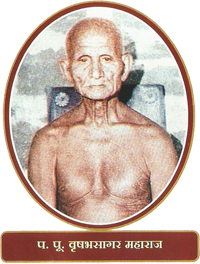 In 1953, in Udgaon he was initiated in the Jain monk order (kshullak deeksha) by Pa. Pu. Ananta-kiriti Maharaj. He further stayed in Kolhapur as a disciple of Shri. Laxmisen Bhattarak Maharaj. As late as in the age of 91, he took up Nirgranth Digambari Deeksha by Pa. Pu. Aadi-sagar Maharaj in year 1968. In this extreme old age too, he travelled across the country, working for the cause of religion. In the age of 111 years, he came to Kunthalgiri. On 12th August, 1982 he began his Sallekhana (fast unto death) and after 41 days of fasting, on the auspicious day of ananta-chaturdashi, 21st Sept. 1982 at 7.58 PM. Every year, on Ananta-Chaturdashi, religious programs are arranged on the occasion of his death anniversary.